This thriller comes from an author with a past as colourful as the characters and events he creates. James Houston Turner was a smuggler behind the Iron Curtain in the days of the Cold War so is well qualified to write about espionage and action adventure. After a visit to his website http://www.jameshoustonturner.com I was eager to find out whether ‘The Identity Factor’ delivered on its promise and potential. This thriller novel concerns a discovery made in the Sinai Peninsula in 1919. An ancient Egyptian tablet has the potential to change the whole world’s perspective on the troubled Middle East and could also ignite Armageddon. Jumping to the present day and the existence of the tablet reemerges when wealthy collector Youssef Qaderi announces to the world that he is in possession of it, the tablet is much sought after by many different factions all with different ideologies and motives. Meanwhile in the USA Rookie CIA profiler and analyst Zoe Gustaves is involved in the hunt for the terrorist Abu Nazer whose identity and appearance is unknown. Universally feared and described as ‘The Phantom’ and ‘Death’s Demon’ Nazer’s influence and terrorist crimes reverberate globally. Enter popular television journalist Rutherford Tyler, a handsome Texan who enjoys country and western music when not hobnobbing with the rich and famous. When he gets the chance to put his investigative journalism skills to the test after a meeting with the alluring and beautiful PA of Qaderi, Sharifa al Rashid he jumps at the chance. It is not long before everyone’s paths cross with potentially far-reaching and devastating consequences. Comparisons have already been made with Dan Brown and Robert Ludlum. After reading this novel I can see why. Turner is a master at creating tension and suspense, putting his characters into intense scenarios and situations that are equally palpable and terrifying. His writing style is very visual, almost cinematic with its vivid descriptions and settings. The novel is clearly well researched and Turner certainly knows his weapons and hardware. It is bold of him to set his novel at the heart of the Arab – Israeli conflict yet he adeptly walks a balanced and reconciliatory rather than inflammatory path. A plot involving the Book of Genesis could upset and ignite many religious factions but instead the book carries a powerful message rather than stoking up old grievances purely for entertainments sake. The characters are well drawn, engaging and convincing and Turner manages to avoid the stereotypes you often find in lesser thrillers lining shop bookshelves these days. I particularly enjoyed the exchanges between the unconventional, impulsive and headstrong Zoe Gustaves and her superior, the imposing Jackson Teague, Deputy Director of the CIA. Their relationship raised quite a few smiles and is reminiscent of a bickering father and daughter and not just two professional colleagues. In fact the creation of the tenacious and persistent Gustaves should be applauded, as she is a wonderfully refreshing deviation from the clean-cut, almost super-human male agents we have become accustomed to. Together with the breakneck action there is plenty of humour and Turner does a good job of humanizing everyone. These are not mere ciphers but people, with all their faults, ticks and failings making the unfolding drama all the more authentic and believable. The Machiavellian plotting ensures there are plenty of twists and surprises along the way and some gadgets that would have Q Branch drooling! With Osama bin Laden and General Ratko Mladic making recent headlines this is a timely contemporary thriller. Unfortunately people like Abu Nazer are actually out there in the ‘real’ world. 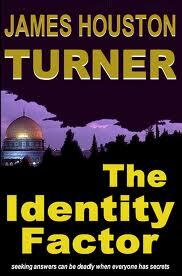 ‘The Identity Factor’ held my attention from its strong opening right up to the final unexpected pay off ending.